This entry was posted on May 30, 2017 by Jessica Anderson. We are excited to announce that we are now serving our customers 100% online! We have decided to close our retail awards showroom in Issaquah; we want to cut our costs and pass those savings onto you! Our retail awards showroom in Issaquah will close on June 30th, 2017. WHAT DOES THIS MEAN TO OUR LOCAL CUSTOMERS? 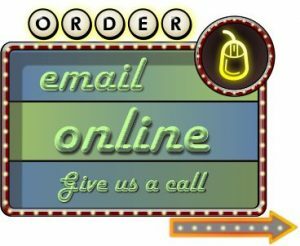 Continue to order via email, online or phone just as before! We want to keep YOU as our customer! Hopefully we can make this transition as easy as possible for you. Call us at 1-877-926-4700 . BUT I PICKED UP IN THE PAST, HOW WILL I GET MY AWARDS? We will continue to offer FREE pickup at our Renton Production Facility. We offer quick 1-Day shipping, FREE for orders over $50. For larger leagues or corporate events, we can deliver. NOTE: you can continue to pick up at our Issaquah location through the spring sports season and the end of the 2016-2017 school year. 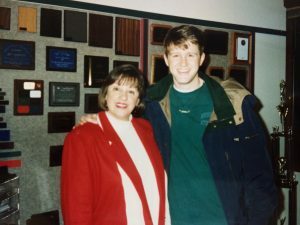 Bonnie and Jeff circa 1994! Since 1987, Issaquah Trophy & Awards served the awards needs of the greater Issaquah community. Read our story here. In 2000, we launched our internet brand Trophies2Go.com, which has been delivering meaningful recognition across the USA. Even though we no longer offer a showroom, you can still expect the same quick production times, exceptional quality and outstanding service! Browse our Trophies2Go website and let us help you recognize someone special in your life now! Our goal is to make you look good, with a cherished award that stands the test of time! Don't waste your time, order online!!! Thank you for your continued patronage through this transition!